"In Spain there is a unique garden ornament not found in any other lands; this is the out of door bookcase. They are four and a half feet high and less than two feet wide. 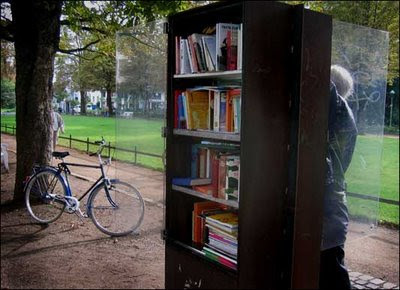 These bookcases are placed in the public parks. The bookcases are tiny and completely faced with tile. They look like jewel caskets, and if they are deep enough to set the books far back they could be used in rainy lands, too, and would be handy places in which to keep the garden records and plans as well as essays and poems for the bookish gardener who never likes to be too far from his favorite authors. No less an authority than Monsieur Forestier told me that there is the record of but one theft from the bookcases, and that of a magazine. In the exposition grounds at Seville, there is a bookcase dedicated to Cervantes in a little square to itself. It is surmounted by a brightly colored porcelain statue of Don Quixote on Rosinante..."
Perfect! I found a way to combine my PhD in English coursework with my passion for gardening. But how DO the books stay dry? I enlarged the photo and I see something that looks like Plexiglass doors standing open on both sides. The one on the right is easier to see. Wow - I wonder if that would survive ten minutes un-vandalized in my city . . .